Popped into the Conway Hall in Red Lion Square on 6th September to meet Robin Houghton and have a mooch around the stands at this year’s Poetry Book Fair together. We found it heartening to chat to dozens of poetry publishers from around the UK, and see evidence of a thriving scene. Poetry’s tendency to experiment with good quality visual design, and unusual formats may actually help protect these small presses. When working as a copywriter in the days of junk mail, I spent countless afternoons with an art director partner, dreaming up different formats (aka ‘paper engineering’) for junk mail. Perhaps it is for that reason I often feel slightly short changed by pedestrian ‘me-too’ production. It may be fortunate for such publishers that poetry doesn’t fare well in ebooks. On a kindle, the poem’s formatting is often wrong, introducing bogus line breaks or ruining the shape of the poem on the page. Seen on a bland screen, the value of these sweated-over words is diminished. Poetry publications in general, and especially publications that use interesting formats, have a tactile quality and shape on the page that enhances the reading experience. Being reminded of this at the fair reassured me that the future of the niche poetry publication scene is secure. More than that, many in the room seemed on a mission powered by a fierce love for what they were doing. Nobody can stop them. Below I enjoyed speaking to Hugh Bryden, of Roncadora Press from Dumfries, and particularly liked the visual style of some of his productions, which he illustrates. 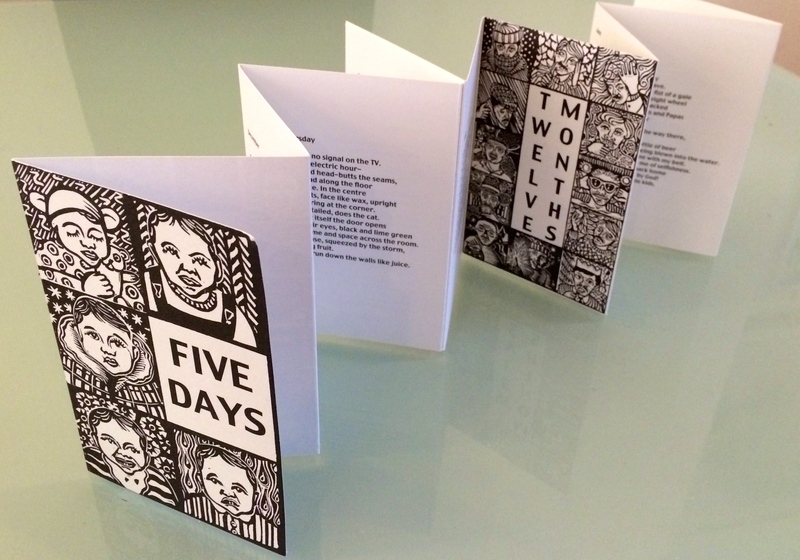 I came away with one example, Five Days A Week/Twelve Months A Year, a limited edition pamphlet designed and illustrated by Hugh, with poems by Hugh McMillan. 17 Poems by Hugh McMillan, designed by Hugh Bryden. This entry was posted in Design, Poetry and tagged Five Days A Week/Twelve Months A Year, Free Verse, Hugh Bryden, Hugh McMillan, poetry, Robin Houghton, The Poetry Book Fair. Bookmark the permalink.